Jordan seems to have weathered an immediate crisis following a week of mass—though largely peaceful—protests that ended in a change of government and the repeal of an unpopular proposed tax law. In retrospect, the protests were bound to happen: the law was only one in a series of unpopular policies taken by the previous government(s) that hurt Jordanians economically and alienated them politically. While the law took center stage in the protests, there was also a call for a change in the overall approach of the government, suggesting that the economy and the political situation would need to be addressed hand-in-hand. 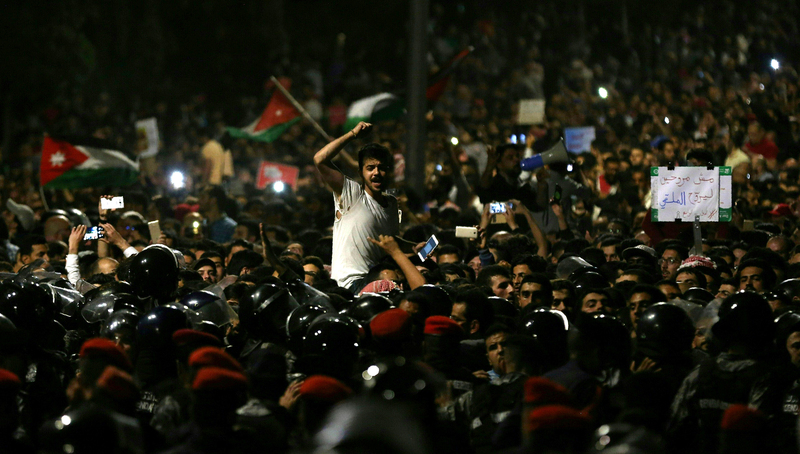 An effective response from Jordan’s leadership and excellent security management prevented protests from spiraling out of control, yet numerous challenges lie ahead. While Jordan has a litany of external stressors, it has also created its fair share of its own problems. The repealed law, for instance, which lowered the income threshold for taxation, was seen as yet another instance of citizens paying the price for the government’s economic mismanagement, corruption, and cronyism. The way in which the authorities rolled out these austerity reforms as fait accompli and failed to communicate or engage with citizens particularly angered Jordanians, especially at a time when the government seems unwilling and/or unable to reduce its own spending. Past neoliberal policies that were similarly intended to foster development and democratization were at best poorly executed, and at worst, an opportunity for corruption. They functioned as a guise under which private and quasi-private sector power centers were able to seize the productive assets of the state without assuming any of its social responsibilities. Over time, these fiefdoms increasingly monopolized power, effectively replacing the country’s traditional elite and even rivaling the power of the state. The result, an undermining of state institutions, meant that the public sector lost many of its best and brightest. On a broader level, a mass exodus of talent headed to more appealing destinations where there was greater opportunity, certainty, and dignity. Despite these domestic shortcomings, Jordan has had an impressive history of survival in an otherwise hostile and unstable region. The Middle East has witnessed a major regional conflict every ten years since 1948, and most of these conflicts have involved Jordan either directly or indirectly. In particular, it has exerted enormous pressures on resources and services as a result of successive waves of refugees. In the past three decades alone, Jordan has received three major waves of refugee populations from crises in which it was largely uninvolved: the first Gulf War in 1991, the Iraq War in 2003, and the Syrian conflict in 2011. During each of these conflicts, Jordan has taken in an astonishing 10 to 20 percent of its population as refugees, which means that Jordan tops a list of 10 countries that together host more than half of the world’s refugees. The numbers of Syrian refugees alone are believed to range between international estimates of 650,000 and governmental ones of 1.4 million. To put this into perspective, the latter figure would be the equivalent of having the population of Canada move to the U.S. The global attention paid to refugees has meant that host-community Jordanians living in comparable, if not worse, socioeconomic conditions feel marginalized and feel that they have not reaped any of the benefits of the international assistance. The country has also had to shoulder a huge security burden that goes largely unnoticed outside of informed circles. Consider the presence of over 1,200 armed groups in Syria at the height of the conflict in 2013 and the less than five miles separating the nearest Jordanian and Syrian cities. Jordan was also hit hard by the loss of Iraq and Syria as export markets, and the loss of Syria in particular as an overland transit route to European markets. How can any country develop a five- or ten-year energy, education, or health strategy in light of these constant shocks and disruption? The short answer: it has to find a way to do so. As a result of the crisis, some of Jordan’s Gulf partners have stepped in to renew previous grant agreements, commit to inject $2.5 billion into the country, and offer further commitments to the International Monetary Fund. Assuming these commitments are forthcoming, they will be important in balancing the country’s budget, potentially leading the way to fiscal stability or a renegotiation of a new deal with the IMF. Ultimately though, this false sense of economic security could be short-lived and it is likely that the country will find itself in a similar situation again in the future. The question is whether the current crisis has been enough of a trigger to change the government’s priorities. The state’s priority should be to focus on domestic wealth stimulation and growth. It is also important to revisit the way in which taxation and subsidies are currently being employed—solely in order to extract cash to cover deficits—compared to their intended purpose of changing behavior and improving the quality of services. There is also a need to readdress the basics, rebuild once-prized institutions, and reverse years of brain drain from the public sector and the country at large. Jordan will always have inherent problems that will make stability a challenge. Depending on external support will always be an easy solution, but the country needs to better prepare itself to weather periods when that support may not be as forthcoming. It also needs to be better prepared to weather the next regional crisis, which, given what history has shown us, is never too far away.